Curiously, it was Fox producer Sol C. Seigel who came over to MGM for this production. Besides owning the rights to Philadelphia Story, MGM was trying to develop a story about the recent phenomena, the Newport Jazz Festival, and thought to combine the two projects into one. It was not the worst of ideas, but a rather superficial one. The Jazz Festival was barely established at the time, only in its second year—and would develop in the years ahead into an interesting clash of classes, cultures, and generations; not to mention a reputation for world-class music. In High Society it’s represented by Louis Armstrong playing a garden party. But never mind. It’s amazing they held so tightly to the Philadelphia story while Porter’s score is comprised of lyrics so non-specific they could fit in any show. Maybe that’s the problem. Also, there are no ensemble or production numbers in the film. It’s all generic solos and duets, with the heroine barely getting half a verse of a single song. It’s pretty cheesy exposition, and sets up an expectation of more Armstrong than the film ever delivers. Not anymore. Sinatra was 40 now. Crosby 53. And Elvis, 21, was stepping out as the new man in town. But even Elvis recorded “True Love,” which despite, or probably because of its simple lyric and sentiment was a cash cow for Porter—his final hit tune. The song earned Cole his fourth and final Oscar nomination (astonishingly he alone of the great Bway songwriters never won an Oscar). 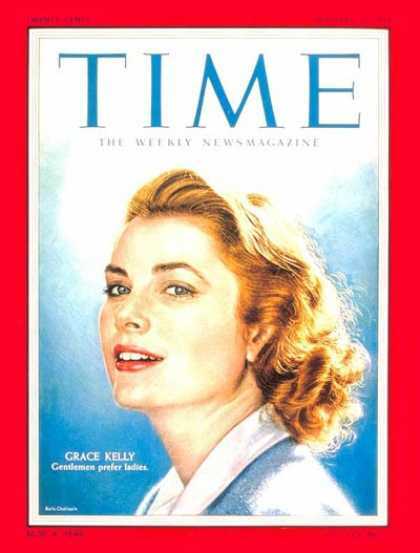 Crosby (and Grace Kelly—who joins in a final few lines) earned gold records for the single, which rose to #5 on Billboard’s chart. It’s been recorded by Jane Powell, The Everly Bros., Patsy Cline, Ricky Nelson, Richard Chamberlain, Connie Francis, Anne Murray, Elton John in duet with Kiki Dee and George Harrison! Aesthetes snub their noses at Porter’s (and Berlin & Rodgers’) later work, and there’s validity in comparison to their younger, groundbreaking and breathtaking songwriting. But what may be lacking in freshness in the later work, is rewarded in the unmistakable musicality that defines them above most others. Thus, if “True Love” seems pedestrian to the cultured musical ear, it is yet unmistakably Porter, which is no small reward in itself. In her ratty old sweater and glasses we could almost buy Grace Kelly as disheveled wife to alcoholic actor Crosby in Country Girl. But here they generate little chemistry together, let alone a romantic past. Crosby seems cast more for his stunt pairing with Sinatra. MGM had also considered Howard Keel for the role—the match with Sinatra wouldn’t have had much resonance, but it might have helped with Kelly. As a second tier musical director at MGM, Charles Walters had a number of studio hits: Good News, Easter Parade, Summer Stock, Lili as well as some Esther Williams vehicles. He also staged his films’ dances—tho there’s little dancing to be had here. But even with all the legendary musical talent (Armstrong, Crosby, Sinatra) the movie doesn’t quite ignite. That didn’t stop it from becoming the 4th highest grossing film of the year, with $6,500,000 in the bank. Sinatra was having quite a year, too. His Guys & Dolls was the year’s top hit, and his third film in the top 15, The Man With the Golden Arm, not a musical, earned him another Oscar nomination—this time in the leading actor category. His records weren’t doing badly either. 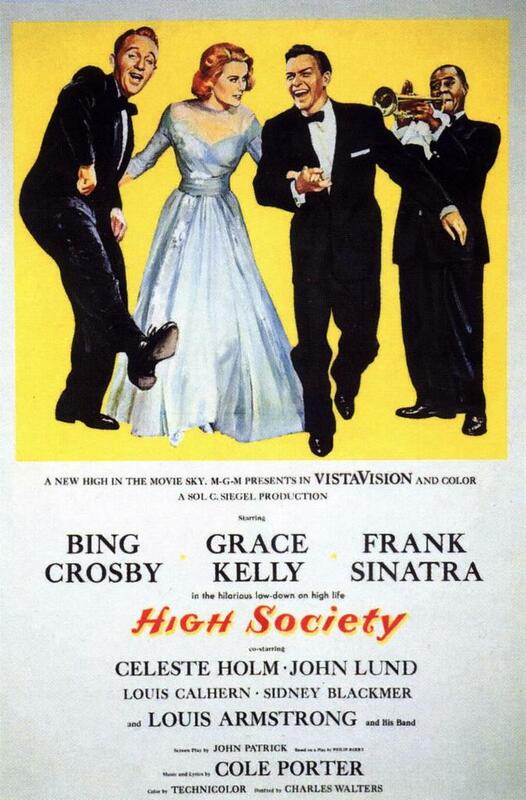 The High Society soundtrack charted for 28 weeks, peaking at #5. But that was small potatoes next to his Songs for Swingin’ Lovers. which hit #2, and charted for nearly a year. But Crosby’s “True Love” single went Gold, and was his biggest hit since the ‘40s. The movie opened in Hlwd on July 17th but didn’t make it to New York until August 9th because of unexpected holdover business for The Eddy Duchin Story at Radio City. The Music Hall usually played films for 4 or 5 weeks, but Duchin was held over for seven. Its successor would hold for just a long. I haven’t much of a history with the film, not getting to it until 1990. George Cukor’s film of Philip Barry’s play, Philadelphia Story had a far greater impact on me, with its sparkling boulevard dialogue and classic ‘30s three-act structure—not to mention its iconic Hlwd cast. In truth, even with Porter songs, High Society doesn’t add much to the original. But the heavy star wattage and a hit song was enuf to ride the wave of Bway-sized musicals that were suddenly dominating the film biz. But few could argue the film has not held up much of a reputation over the decades since. It must have some fans, or would it have made it otherwise onto Bway some 42 years later? Inspired in part by such Gershwin reconstructions like My One & Only and Crazy for You, and encouraged by their success, you can see the commercial potential for a Porter catalog show. Fidelity was still accorded The Philadelphia Story so the Porter trunk wasn’t shamefully mined for hits at the expense of narrative logic (tho picking two songs from Can-Can seems unnecessary). Arthur Kopit wrote a polished and clever new book, scuttling all traces of the Newport Jazz festival—and once again shifting the location, this time to Oyster Bay, Long Island. The rich are rich wherever they are. The songlist was highly appealing, and the cast, if not famous was of vintage 90s Bway talent. The show had just about everything except for one thing: it seemed blind to being a musical. The songs were played and performed as tho they were something to be endured between dialogue scenes—instead of the other way around. Compare it to the stage reboot of White Christmas, which whatever else you say about it, unquestionably knows its priority is to put the contagious Berlin tunes front & center. They did the opposite on High Society, and it flopped. (But to the ear, free of the leaden production, the DRG recording is surprisingly delightful. The film’s songs are given a polish, and some of the interpolations are quite effective. It also sneaks in some true production numbers.) There’s potential for a truly exciting realization of this show with a bit more tweaking of the song selection—and of course some talented, musical direction. Maybe someone will give it another try.